Total area of 7 ha, at an altitude of 500 - 550 m.
by clay soil that favours viticulture. The location of the Arvanitidis Estate linear vineyard was carefully selected for its soil composition, well balanced in sand and clay, ideal for restrained plant growth. has a southwestern exposure to the sun, ideal for the sunlight and temperature conditions in Greece. 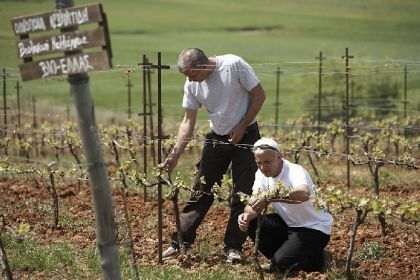 During summer, the region receives an upcoming breeze from Lake Koronia that favours the ripeness of grapes. The presence of this breeze also hinders the appearance of wine diseases and helps maintain the grapes in good health. Planting is dense, with 3.000 - 4.000 vines per ha, while the rootstock used is 1103Ρ. Chardonnay, Cabernet Sauvignon, Merlot, Syrah are the varieties currently cultivated, while Nebbiolo and Barbera are cultivated experimentally. In 2009 new parts of the vineyard were planted with Greek varieties Malagousia and Xinomavro to create the new labels of the estate.